weighing up to 1,000 lbs if brackets are spaced no more than 18" on center. Double brackets should be spaced no more than 12" on center. 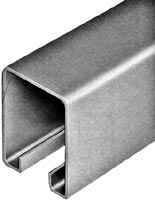 with a galvanized finish for a long corrosion-free life. Available in 8', 10' & 12' lengths. mounted to the header approximately every 16" to 18" on center. Lead time for #4 track packages is usually 1 week or less from paid order to ship date. Please provide a phone number at checkout. The #4 box rail kits are for single track runs only. For other applications, please contact us at 740-972-2275 or email sales@slidingdoorpros.com. Choose your trolley style when you purchase a package. We offer your choice of straight bolt or apron strap trolleys. An 8' #4 heavy duty rail package kit can accommodate one 4' wide door, up to 1,000 lbs. End Blinds fit into the end of the track to keep it free from birds, weather and other obstructions. #4 Track End Blinds are designed for use with Heavy Duty #4 Track Brackets.